Rothesay is the main town on Bute and the gateway to the island. There are a number of visitor attractions in the town, such as the Discovery Centre, the remains of St Mary’s Church, built in the early 1300s, and Rothesay Castle, one of the best surviving medieval castles in Scotland. Kilchattan Bay, Isle of Bute. Waterside haven of peace & tranquillity. Beautiful bungalow, comfortable, cosy & fully equipped with all home comforts, including dishwasher & Wifi. Panoramic views of river Clyde, Cumbrae Isles & Ayrshire Coast. Nearest town – Rothesay. This stunning cottage is set on the beautiful Isle of Bute, five miles from Rothesay, and can sleep six people in three bedrooms. A superb coastal property, mostly ground floor, near Rothesay on the Isle of Bute and can sleep eight people in four bedrooms. 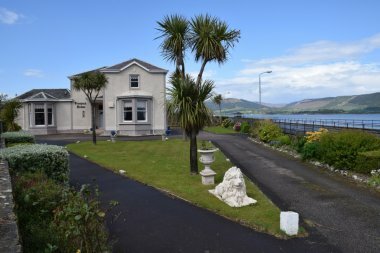 This is a stunning, detached cottage on the beautiful Isle of Bute and can sleep 12 people in six bedrooms. A ground floor cottage situated near Rothesay on the Isle of Bute and can sleep eight people in four bedrooms. One Marine Place is a converted 160 year old Georgian house called Prospect House, one and half miles from the town of Rothesay on the Isle of Bute. There are 5 extremely spacious apartments and a private cottage.